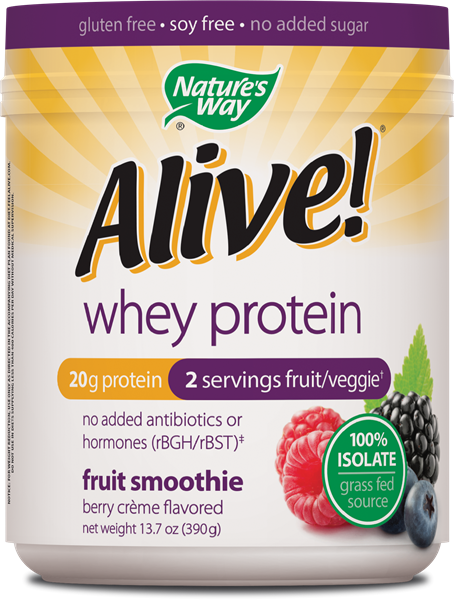 Alive!® Whey Protein (Berry) - Nature's Way®. †Each 39 g serving (2 scoops) provides the equivalence of ½ cup fruit and ½ cup vegetable (volume before drying). Whey Protein Isolate, Organic Apple Powder, Organic Carrot Powder, Organic Natural Flavors, Xanthan gum, Organic Red Beet Juice Powder (Color), Organic Stevia Leaf Extract, Sunflower Lecithin, Malic Acid, Organic Blueberry Powder, Silica.